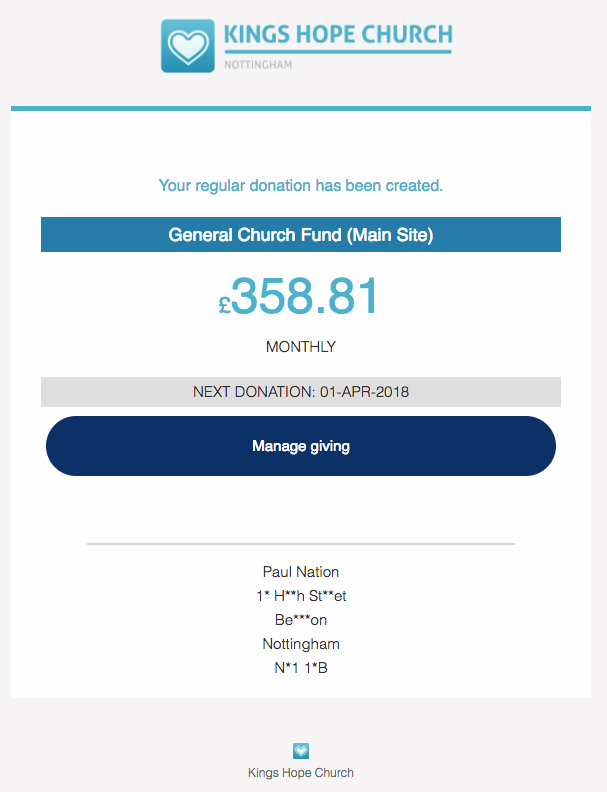 The Giving module includes a great feature that enables churches to easily accept one-off and recurring online donations through their website (Embed), at your Information Desk (Connect), and through our member-facing platform (My ChurchSuite) - it's called Donate. You can even direct people to Donate by distributing an embedded link in your email or SMS communications. Like the rest of ChurchSuite, Donate is beautifully styled using your church's colour palette and logo. via SMS/Text using your Textlocal or Twilio integration. The user experience begins with a choice of Fund - depending on your Fund visibility settings - and whether the donation is recurring or one-off or both. For UK churches, givers can select whether to Gift Aid their donation(s). ChurchSuite uses the giver's email address to try and match the donation(s) to an existing giver profile, or a new profile will be created where the email address is not matched. Next, the giver is invited to confirm they have read, understood and accept your Data Protection statement, giving their consent for you to process their personal data. Without consent the giver will be unable to proceed with their online donation. If the email address provided can be matched to either an existing contact in the Address Book or a giver profile in the Giving module, the giver is asked to confirm the match (see below), or to select -- I am not in this list --; which will create a new giver profile in the Giving module. If there are multiple people in the Address Book or Giving module that match the email address provided (e.g., a spouse/partner with a shared email address), the giver is asked to select the correct profile from the list, or select -- I am not in this list --. Where a new giver profile is going to be created, and always when donations are Gift Aided but there is not currently a full, valid postal address for the giver, the giver is asked to submit personal details comprising of a valid address and postcode. ... or a card donation (Stripe), which will require entry of their card details. For both selections, the giver is informed of the transaction fees and, subject to your Giving module options, can be invited to optionally increase their donation to cover those transaction fees so that the church receives the full donation. UK churches - note that HMRC permits Gift Aid to be claimed on the gross donation before transaction fees, even though the net amount received in your church bank account is net of fees; since the gross donation was the actual amount donated and fees are simply a cost of collection. ChurchSuite correctly handles Gift Aid calculations in this regard when processing your Gift Aid claim. ...or for Card donations, they simply enter their card details through Stripe's secure card form. Both Stripe and GoCardless Pro take care of all the payment authentication and processing. Once the payment is verified and approved, a "success message" confirms to the giver that their donation(s) has been successfully processed, and an email confirmation of the donation(s) is sent to the giver's email address. For recurring donations, an email confirmation will be sent each time a donation is processed. What happens to the online donations next? Where the email address of the giver was not matched to an existing giver profile or Address Book contact, a new giver profile will have been created in the Giving module. For one-off donations, these are automatically and immediately recorded against the giver profile in the Giving module in ChurchSuite - these can be easily viewed using the Online Donations report in the Giving module > Reports section, and on the Donations tab of the giver profile. For recurring donations, a "pledge" is added against the giver profile. The donations are recorded against the giver profile on each date that the recurring donation is processed by Stripe/GoCardless Pro. The giver will also receive an email confirmation each time a pledge donation is processed. When a giver sets up a new recurring donation, the confirmation email will contain a Manage giving button that enables the giver to manage their regular giving for that pledge.The Manage giving option is also available to a giver through the My Givig section of My ChurchSuite. For recurring Direct Debit donations, Manage giving allows the giver to cancel their donation or edit the amount. If the giver wishes to change the due date then the existing direct debit must first be cancelled and new direct debit set up using Donate. For recurring card donations (see below), the giver is able to edit their regular giving (perhaps to change the amount or add an end date to their donations), to change the card their future donations are processed against, or to cancel their pledge entirely. In each case, a confirmation email of the changes is sent to the giver and a change log recorded against the giver's profile in ChurchSuite. 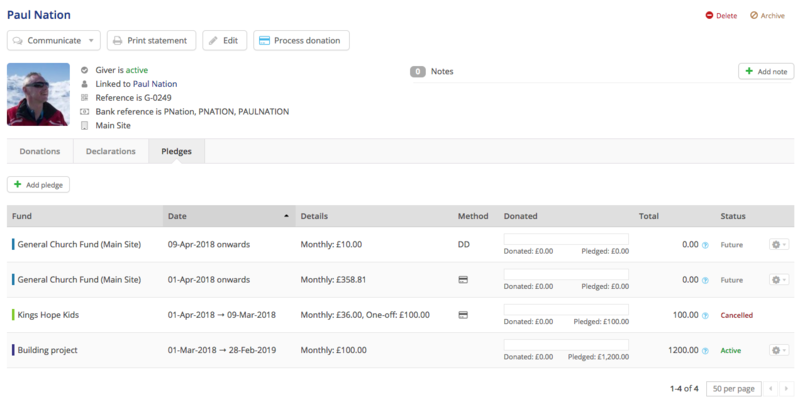 The Online Donations and Subscriptions reports in the Giving module > Reports section can be used to view recurring donation pledges and the status of online donations as they are processed by Stripe and GoCardless. For UK churches, Gift Aided online donations will correctly show with an Unclaimed status where a valid Gift Aid declaration continues to be held - Gift Aid will be claimable on those donations when you next complete a Gift Aid claim. For one-off online donations, a "one-day" electronic Gift Aid declaration is created against the giver profile to cover the donation. For recurring donations, an "enduring" Gift Aid declaration is created with a start date, but no end date. The declaration start date is from the date the pledge is first created. In order to reclaim Gift Aid on a giver's other donations in the previous four years you will still need to obtain a separate declaration to cover those dates. For the giver, the donation is automatically debited from their bank account or charged to their card on the due date(s), and this is deposited into your church's designated bank account net of transaction fees. The giver will receive a fund-specific email confirmation for the donation(s), which can be customised in Giving > Funds (including the fund's "brand", which pulls through to Fund pages and branded confirmation emails). The same Manage giving option is available to givers in the My Giving > Pledges section of My ChurchSuite (if this section has been enabled in your Giving module options). Here, givers can edit/cancel their recurring direct debit or card donations. Cancelled pledges remain visible in My Giving for two months, after which they are hidden from the page. Please note that GoCardless's services are not available in all countries. Check their website for a list of supported countries. However, it is still possible to accept both recurring and one-off card donations through Stripe - a debit card donation is exactly the same as a direct debit/ACH payment. To enable ChurchSuite Donate, simply go to the Giving module and locate the box in the right-hand column that says Online giving. Note, you will need Administrator access to complete these integrations on your account. Clicking the Enable Direct Debit giving button will open the GoCardless Integration page. GoCardless is the payment provider ChurchSuite uses for receiving Direct Debit payments and donations from individual's bank accounts. One-off and recurring Direct Debit donations accepted through ChurchSuite Donate are subject to a 2% transaction fee (minimum 20p). The transaction fee consists of two parts - a 1% transaction fee to GoCardless (capped at a maximum of £2) and a 1% transaction fee to ChurchSuite (also capped at £2). For donations < £20, the fee is calculated as 20p to GoCardless and 1% to ChurchSuite. For donations > £20, the fee is calculated as 1% to GoCardless (capped at £2, minimum 20p) and 1% to ChurchSuite (capped at £2, no minimum). Maximum fee is therefore £4. For more information about GoCardless click here. In addition to the UK-based BACS direct debit system, ChurchSuite has also implemented the SEPA Direct Debit system used across the Eurozone. The payment provider for this is also GoCardless. For more information on countries and availability, click here. Fees correct as of 6th September 2018. Make sure you have your charity number, bank account number and sort code ready, then click Save and Proceed. This will take you to the GoCardless website. 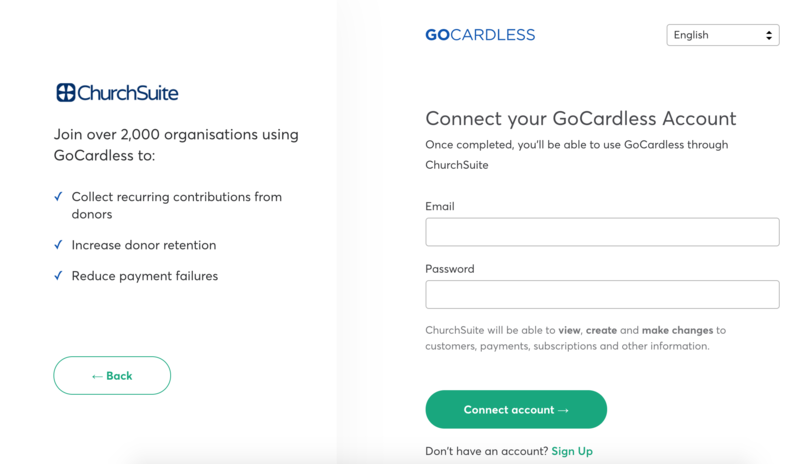 Follow the on-screen instructions with GoCardless to create an account (or sign in to an existing account if you have one), and when prompted, click to agree to Connect [your GoCardless] account to ChurchSuite. Once completed you'll be returned back to the Integration page in ChurchSuite (which can also be accessed through "Administrator" > "Integrations") and it should look like this - the integration is complete and you're ready to begin receiving Direct Debit donations using Donate! Note the option to Add another account, which will enable you to integrate other GoCardless Pro accounts and then assign those account(s) to a particular fund(s) - ideal if you want your "Building Project Fund" online donations to go into a different bank account to your regular donations. See later in this article for further information. In order to update your payout bank account details, log into your GoCardless account. From the dashboard navigate to Settings > Company info > Edit account details > Connect your bank account > update and follow the on-screen instructions - if requested, select the GoCardless Standard (free) account. Note: this process will take you through the verification of the new bank account details provided. This usually takes 2-3 working days to verify. In the meantime, payouts will be frozen. They will then be automatically released to your new bank account once verification is complete. If you want to enable credit/debit card giving click Enable credit/debit card giving on the main Giving page. 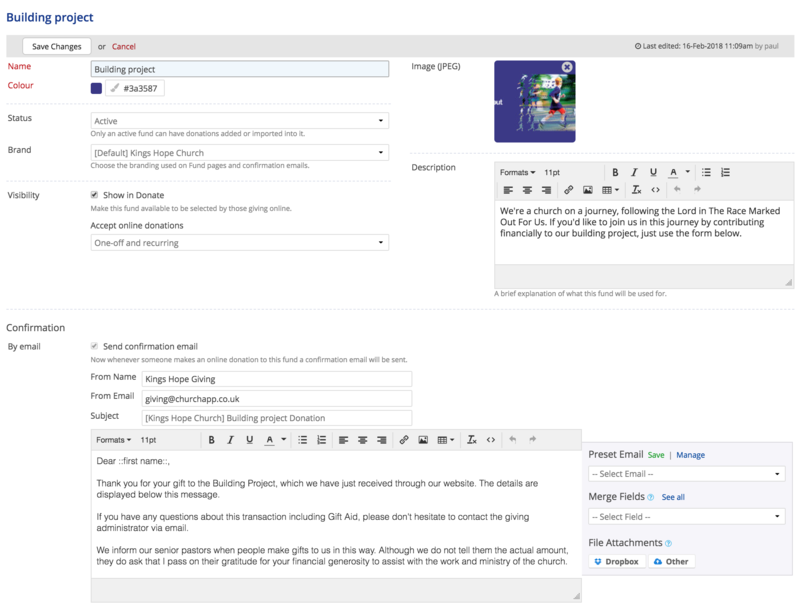 From there you'll be taken to the Stripe Integration in the Administrator section of ChurchSuite, and then on to Stripe's website to complete the process. For detailed guidance on setting-up the Stripe integration see our related support article on "Integrating Stripe for online payments". Once the integration is complete you're ready to begin receiving card donations using Donate! Having completed the Stripe and/or GoCardless Pro integrations, and with Administrator or 'manage module' user permissions, head into the Giving module options - the cog wheels icon in the top right corner of the module. At the top of the Donate settings page there's a grey shaded box Online Giving Options, which includes a link to your church's Donate page - this is the link you'll use to embed into your communications promoting online giving, and to embed Donate into your website. Working through each of the Donate module options (image above), select the Integrations through which you will accept donations, tick the Transaction fees box as appropriate, and customise the Success Message that will display 'on-screen' once someone has successfully made their donation. Click Save Changes before navigating away from the module settings. Now, you simply need to make available the link to your Donate page in your website and/or in your communications. 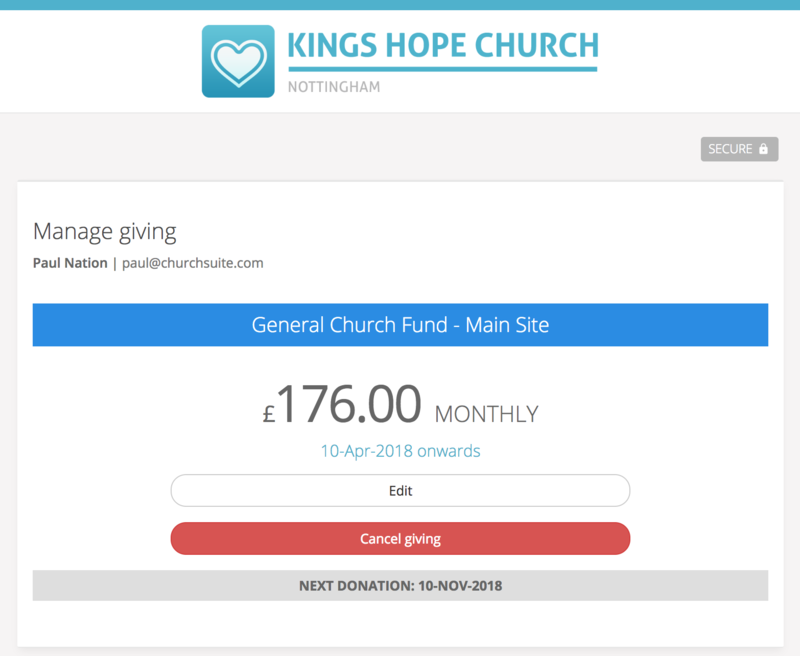 Donate can also be accessed by church members within the My Giving section of My ChurchSuite, and you can also enable SMS giving (see related support article), enabling givers to text an amount to your church's SMS giving number, and they will receive a reply back with a link to your Donate page, with all their details pre-populated. We have prepared some ready-made "Donate" buttons for you to use on your church website. If you want to use them, download the ChurchSuite Donate buttons library (this is a zip file that you need to extract once downloaded) and choose the button you want to use. Embed the button image into your website and link the button to your Donate page URL as suggested in the shaded box in the previous image. As an alternative to adding a Donate button within your website, you may wish to embed the Donate interface directly into a page within your website. To achieve this, simply copy and paste your church's Donate URL into an <iFrame> container in the source code section of the web page. 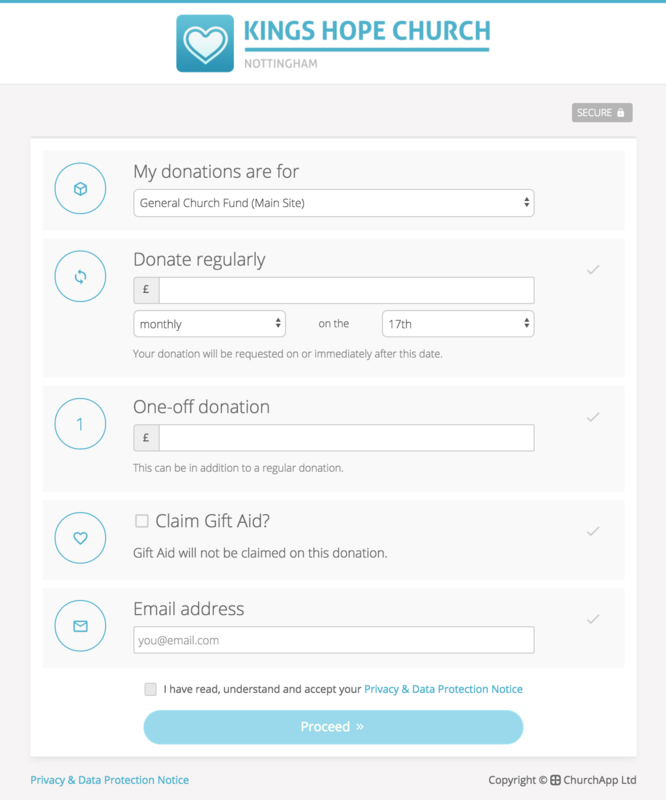 Your church's unique URL can be found in the Giving module settings on the Donate tab - notice the unique URL in the grey shaded box, "You can access ChurchSuite Donate at..."
You can accept different fund donations to different bank accounts using the "Add another account" option on both the Stripe and GoCardless Pro integrations. 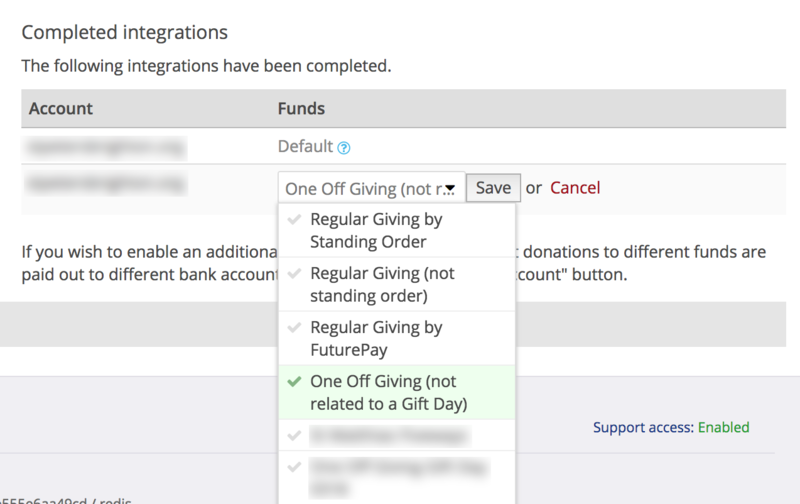 Once the additional account(s) are added to the integration you can then select to link that account to a specific fund/s within your Giving module. For example, churches will often collect donations in support of particular causes (i.e., disaster relief, international outreach, etc) for which they might create a specific fund within the Giving module. 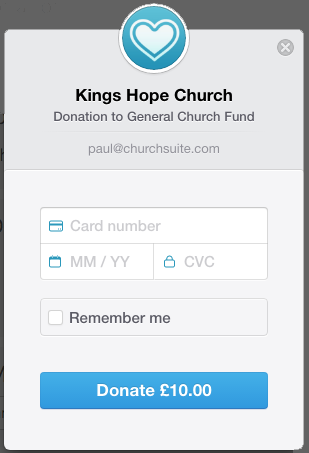 In situations where churches want the donations made to that fund to go to a different bank account than the one used to collect regular donations, use the Add another account option in the respective Stripe and GoCardless Pro Integrations (In Administrator > Integrations), and then link that new bank account to the relevant cause-specific fund. Note that you will need to set up a new GoCardless Pro account (with different login details for each) for each bank account you wish to accept direct debit payments into. For Stripe you can add a new account within your existing Stripe profile. 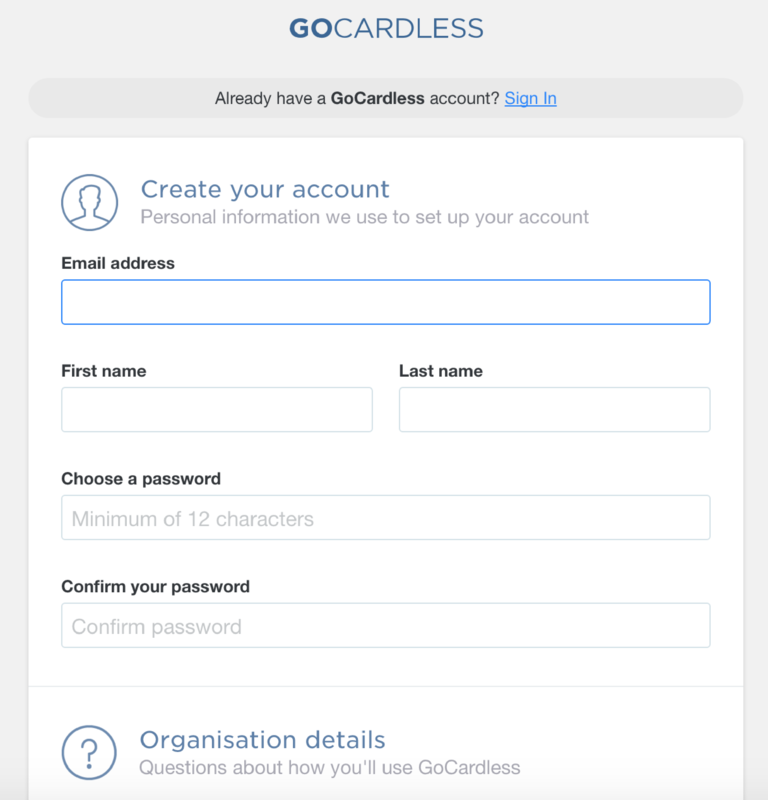 For GoCardless, when selecting "Add another account" in the GoCardless Pro Integration, you are directed to the GoCardless "Create a new account" page. Complete the steps to sign up and verify your church's bank account. 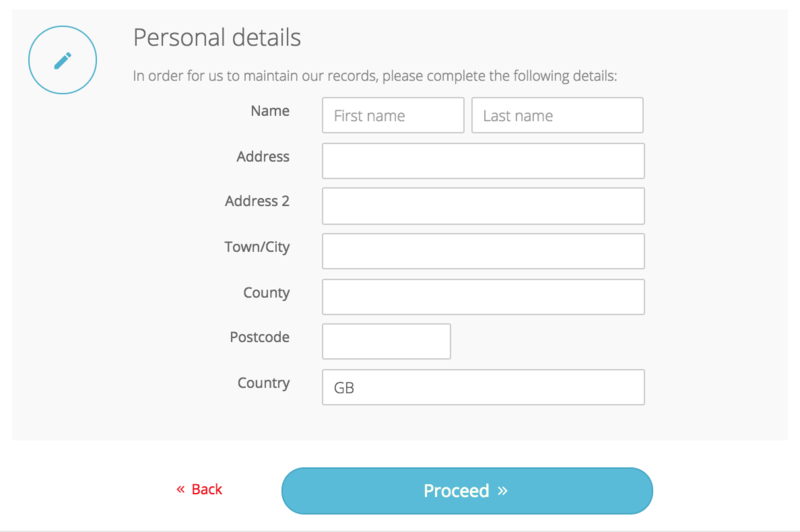 Make sure you proceed with Creating your account - rather than signing in to your existing account. 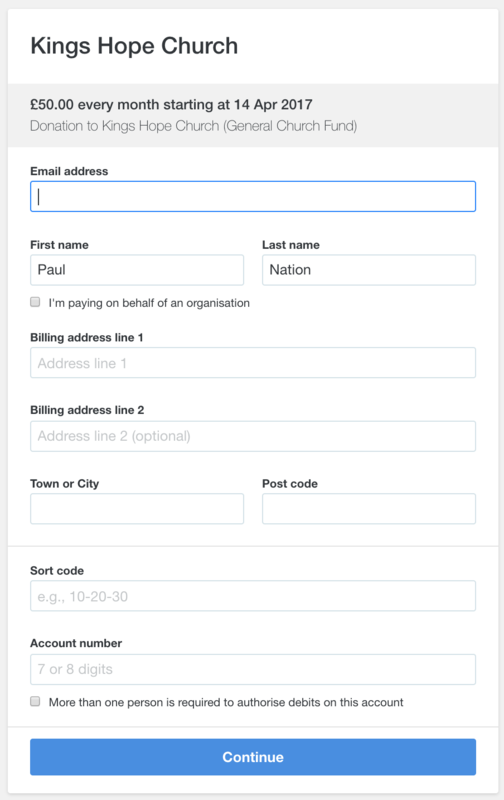 For Stripe you will first need to create a new account within your existing Stripe profile. Next, select Add another account in the Stripe Integration, which will take you to the Stripe login screen. Select Sign in in the top right-hand corner. Follow Stripe's on-screen instructions to add a new bank account. Once you are returned to the ChurchSuite Integration page (for either Stripe or GoCardless) you'll see your default account and your newly added account, which you can now assign for donation Funds. Click the Edit button in the list of Funds and use the drop-down menu to select the fund(s) that you want to link to that new bank account (see below). Online donations made to that fund(s) will then be deposited into that bank account moving forwards. In the Giving module > Reports section are a selection of reports to assist finance teams with reconciling donations received online, either by Stripe Transfer or GoCardless Subscription. Note: Churches and givers are currently unable to modify the due date or fund of recurring donations made by GoCardless (Direct Debit); but the church can Cancel a subscription so that the giver can then set up a new direct debit if they wish (perhaps for a different due date or fund). If a giver has successfully set up a recurring donation to your church, the pledge subscription will be shown in the Subscriptions report. Users are also able to manage recurring online donations from the Pledges tab of a giver's profile. Pledges can be edited (with permission of course!) or cancelled. All user changes are recorded in the Pledge change log and a confirmation email is always sent to the giver and that send confirmation is logged in their Recent Activity > Communication log on the giver profile. That an active subscription for the giver is showing in the above report. If not, confirm first that your GoCardless Pro/Stripe integration has been completed successfully in "Administrator" > "Integrations". If you have multiple church bank accounts configured in GoCardless Pro or Stripe, to which you can receive donations, check that you are looking for the donations in the correct account. Check that you have assigned valid bank details to your Stripe or GoCardless account. You'll need to log in to your Stripe or GoCardless Pro account to confirm this. Check that the giver has actually set up a subscription to your church and not to somewhere else.